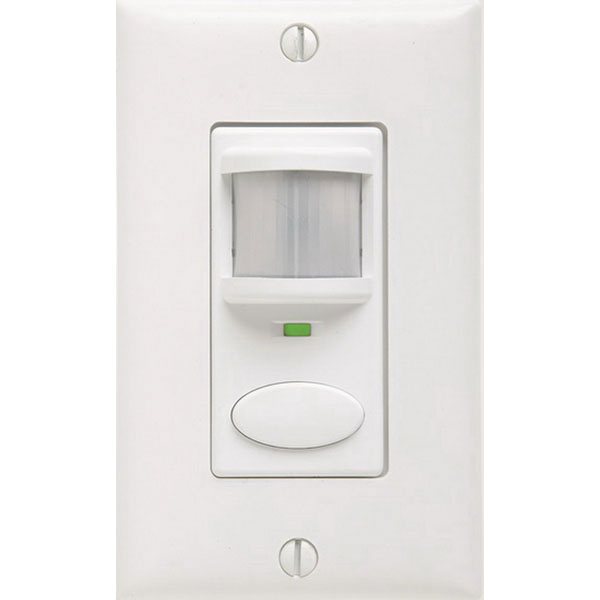 Lithonia Lighting Sensor Switch™ Dual technology single relay wall switch vacancy sensor in white color, has a gloss finish to blend with interior decor. It combines passive infrared and patented microphonics detection technology to locate and listen to the occupants. The sensor with self grounding mounting strap, senses small motion in the area ranging from 20-ft to 625-Sq-ft and large motion from >36-ft to 2025-Sq-ft. This sensor incorporates self-contained relay, which does not demand for power pack. The pushbutton can be programmed without removal of the switch plate. It is ideal for education, government, healthcare, hospitality, manufacturing, offices, banks, religious, retail, sports, recreation and warehouses applications. The vacancy sensor meets UL, cULus, RoHS and NEC 2011 Section 404.2C standards.